Here is the pill box. I had resisted using it for a month or so but, finally picked one up at Walgreens. I have to admit that it is easier to use than individual bottles. And, I can easily tell whether I took my pills or not. However, it does not accommodate my complicated regimen. Just looking at it makes me feel old. I went back to the doctor on Monday. They said the Clostridium Difficile is gone. They did not test for it because the sample I gave them was not watery enough. (I think that is a good sign.) She said they know it is gone because they did not see any white blood cells in the sample. It is great news I suppose. I am still unhappy about pooping four to six times a day, though. To address that, I am switching from the no fiber diet to a high fiber diet – gradually. I have cut back on the Vancomycin to three times a day. This month, the monthly birthday was also and annual birthday and a big one, at that. I baked Andy’s favorite, Fudgy Chocolate Layer Cake, with raspberry jam between the layers. Owen and Cam helped me. I almost had a nervous breakdown with all that help. The cake was on the cooling racks. I was on the far side of the kitchen with my back to it, making the frosting. I heard the boys singing Patty Cake and was charmed that they were singing the same version that my mother sang to me. I turned around to realize that they were patting the cake layers. Hard. One was still in pretty good shape. The one that ended up as the top layer was in six pieces with a huge crack down the center. I used a large amount of frosting to glue it back together. Whenever I worked on the cake, Cam was dipping into the bowl of frosting and eating large gobs off the beater. My frosting cooled and became impossible to spread so I warmed it a tad in the microwave. With the gluing and eating, I ran out of frosting before the sides were covered. Jennifer made up another batch to finish the job. 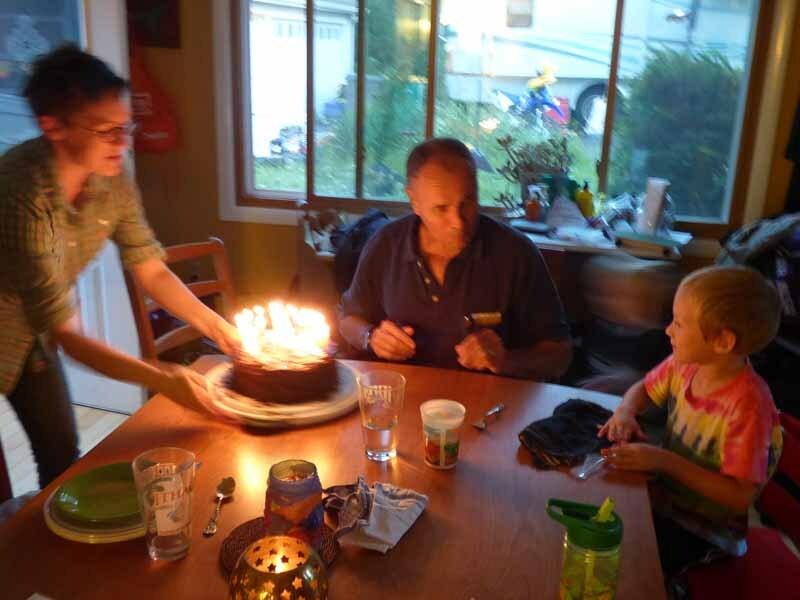 We learned not to put too many candles on the cake ten years ago. 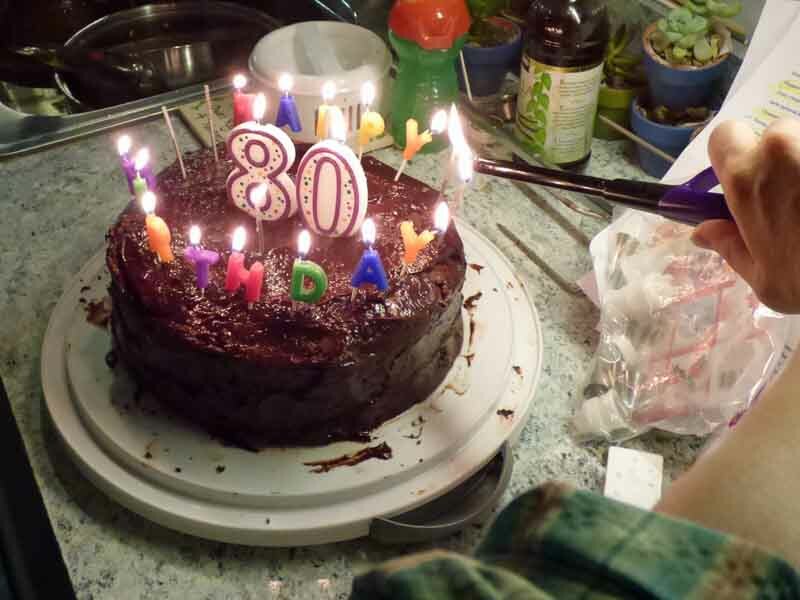 I bought an eight and a zero, some candles that spell happy birthday. and a few sparkler candles. This was the only photo I got showing the candles. Off it went to the table. 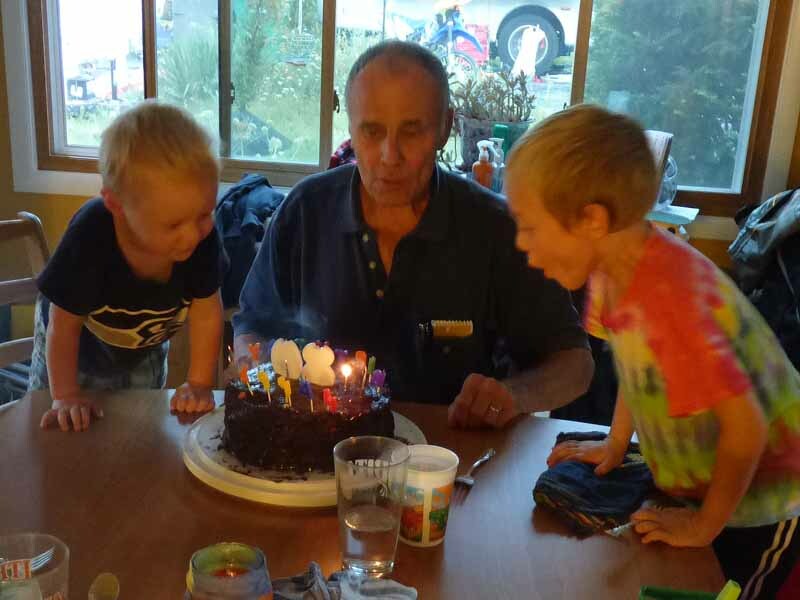 Cam and Owen helped Andy blow out the candles. It was delicious with all that extra chocolate. The next morning Jennifer complained that Cam was up all night on a sugar high. She and George were exhausted and sleep deprived. Andy’s daughter Kathy came to visit for his birthday. On Monday, when George and Jennifer went to work, we took Kathy to see a bit of downtown Milwaukee. Our first stop was Clock Shadow Cheese Factory. They have a nice tour with a full explanation of cheese making, but the building itself was more fascinating, by far. It is an American Institute of Architects Top Ten building. 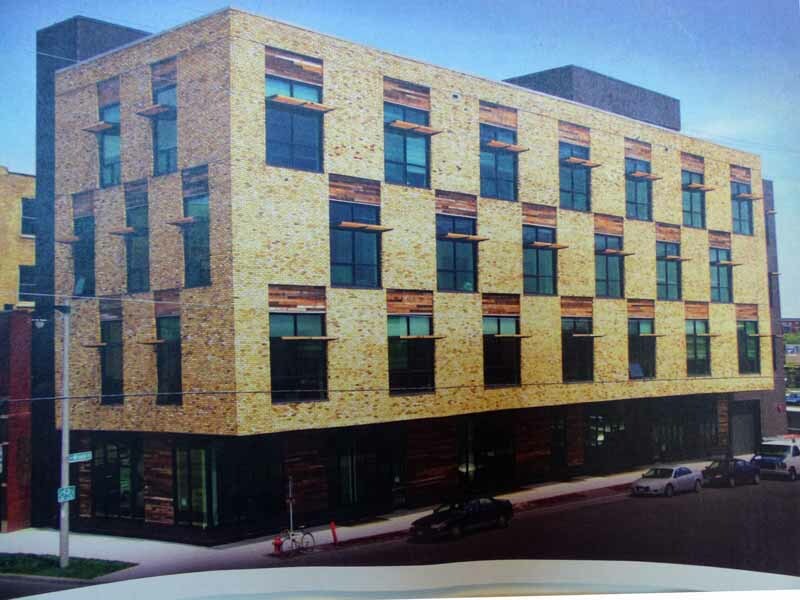 Much (50%, I think) of it is built with recycled materials on an industrial waste site. The awnings over the windows are made from ash trees killed by the Emerald Ash Borer. The siding at street level is made with old pickle barrels. Much of the hardware such as stair railings is made from repurposed plumbing pipes. 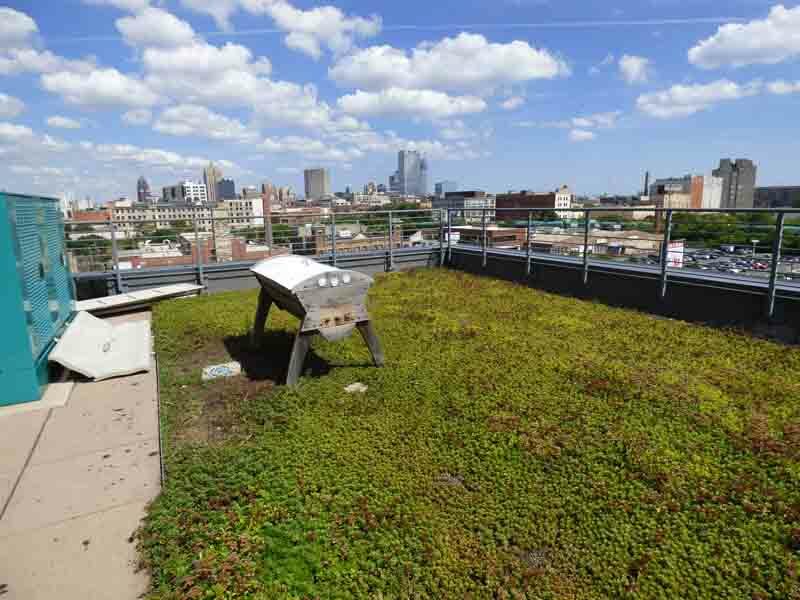 They collect rainwater on the roof for flushing the toilets. And, there is a garden up there! With a bee hive. 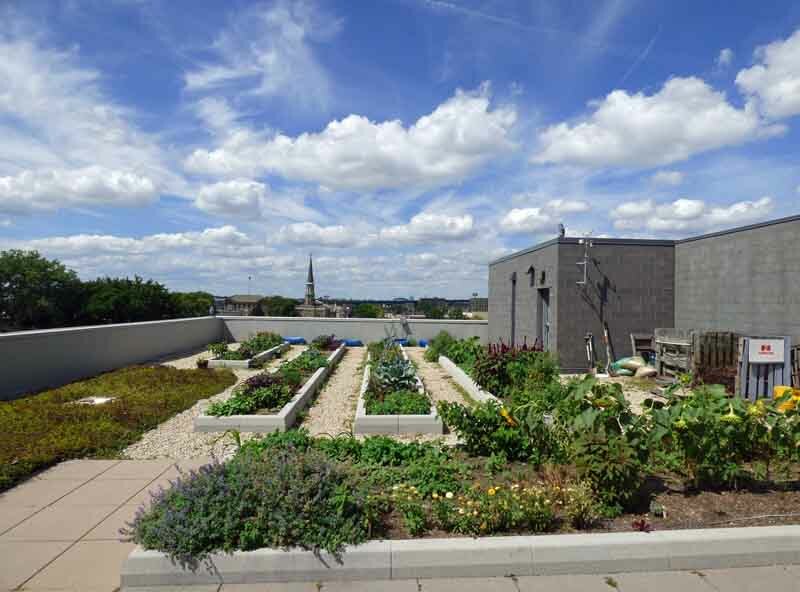 This is a community garden used by the building’s tenants. There is so much more so I’ll just link to something about it. Here. 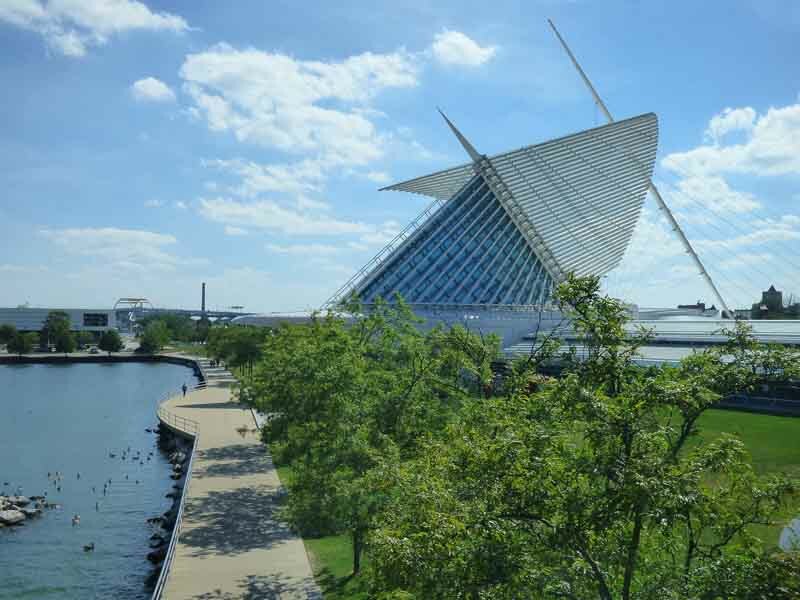 Our next stop was the Milwaukee Art Museum, my favorite building on the Lake Michigan waterfront. Here, we are approaching from the rooftop plaza of the parking garage across the street. This is the lake view on the waterfront side. Kathy took a picture of the ceiling, looking back toward the entrance doors. Later, when we were in the galleries looking at the art, we saw that the wings were open atop the Calatrava (the architect) building. There is a lot of art of all genres. 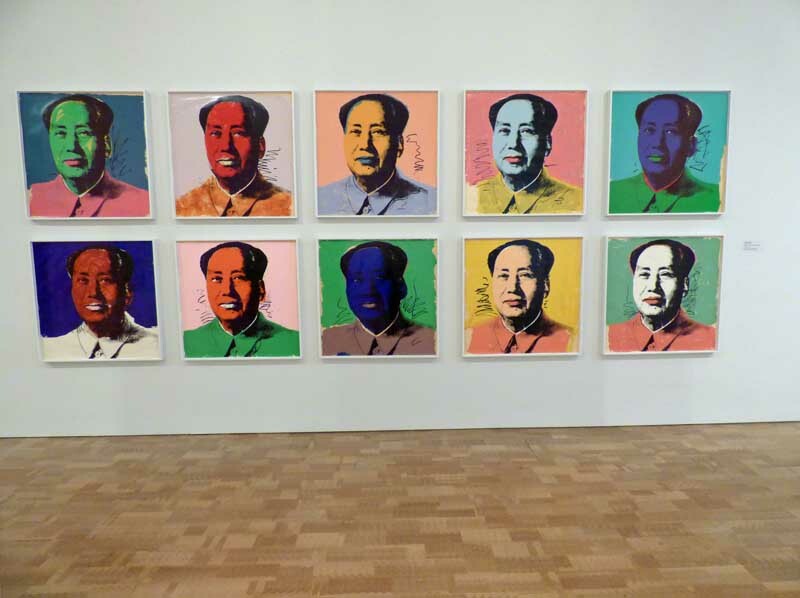 Here is Andy Warhol’s Mao Tse-tung series. They also have several soup cans. This janitor is a favorite. I read a fascinating article about preservation efforts. 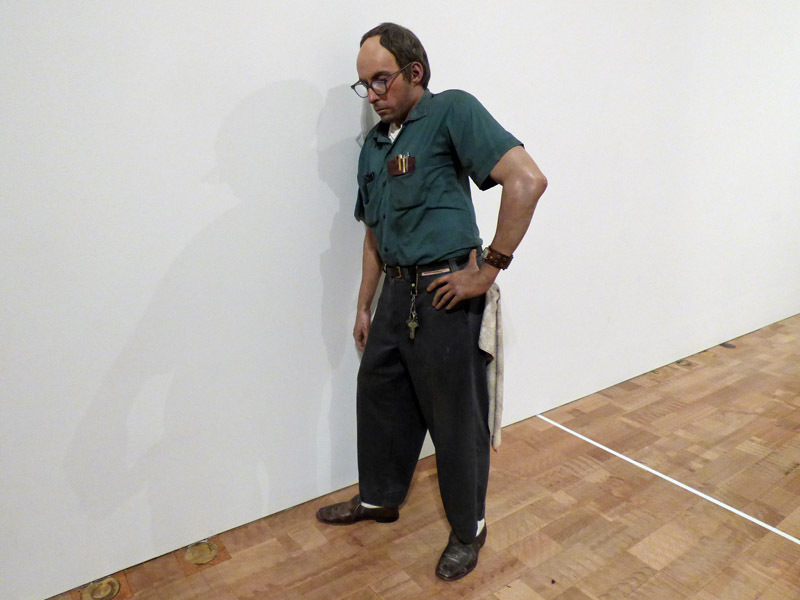 He is life-size and very realistic. 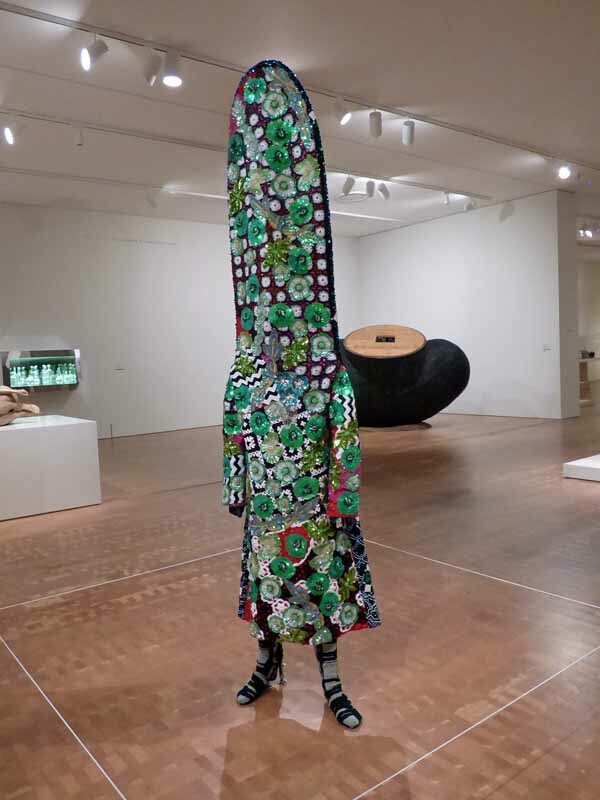 Although there are plenty of old masters, there are plenty of strange works of art in the museum. Some, I suppose, were just made to make me gawk. Here is an odd number. The body is life-size. Here is another view of the open wings taken as we walked back to the parking garage. 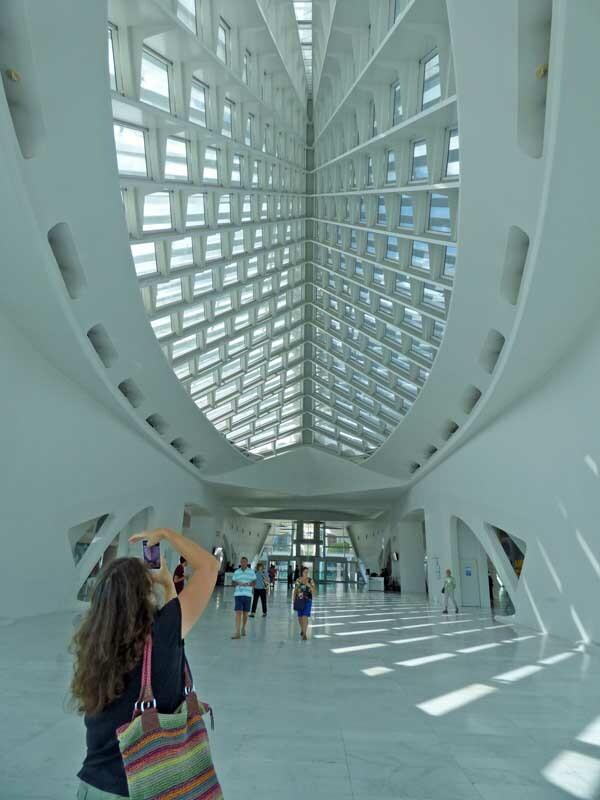 The amazing, long white hall to the left of the Calatrava building leads to the galleries. It also houses the temporary exhibits. We met George and Jennifer, and the boys, at the Creel in Thiensville for dinner. 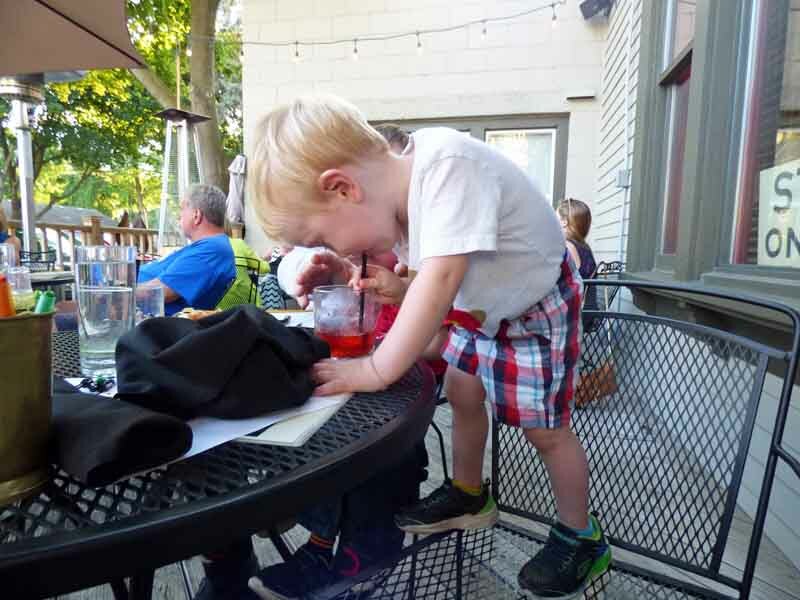 Cam had to stand on the chair to drink out of the straw. Happy Birthday Andy. Good news Di. We saw his Olympic buildings in Valencia, Spain and several bridges that had to be his. I love them. I know nothing about it really but loved to look at, or just notice, architecture. Calatrava building stop you mid-breath. The Patty Cake part made me laugh out loud. Your family will be telling that story at the Thanksgiving table for years. You are right. I’ll be reminding the boys of that for the rest of my life! While I was in the kitchen with two exuberant helpers, the rest of the adults were sitting at the table ignoring the commotion. Maybe I’ll be laughing about it next week. Four pill slots a day did not work for Vancomycin every six hours, Metronidazole every eight hours, probiotics in between. I do like the colors though. I’ll tell Andy his age in Celsius tomorrow. Very funny. That handsome man is eighty????!!!!???? Sheesh! Yes, we are always laughing. So glad you are better! Happy birthday to Andy! I think you find the most fascinating places! great about the c-diff! loved the whole blog! must look up the art museum–what’s the deal with the wings? I thought the wings had to do with the sun, but Jennifer said they open and close them on a schedule, not related to the sun. I have never seen them move.